Moisture measurement in the production of dry animal feed/kibble is desirable at numerous stages during the manufacturing process. With varying moisture content in raw materials, on-line NIR measurement is a key tool in ensuring optimum efficiency and quality control. The ability to measure moisture and make process adjustments during the production cycle is key. Moisture content of an animal feed/kibble is expressed as a percentage: dry kibble tends to have a moisture content of between 6 and 12%, semi-moist foods between 15-30% and wet foods around 75%. The moisture content plays a major role in the percentages of other ingredients in the animal feed including the amounts of protein, carbohydrate and fats. 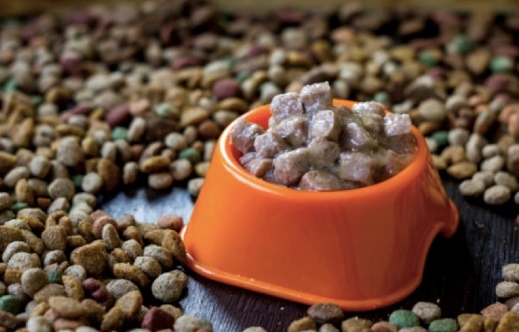 The guaranteed analysis of pet foods reveals the total percentage from protein, fat, fiber and moisture; if we remove the moisture element, the percentage of the other substrates will increase dramatically – which is what pet owners seek in wet and dry kibble. 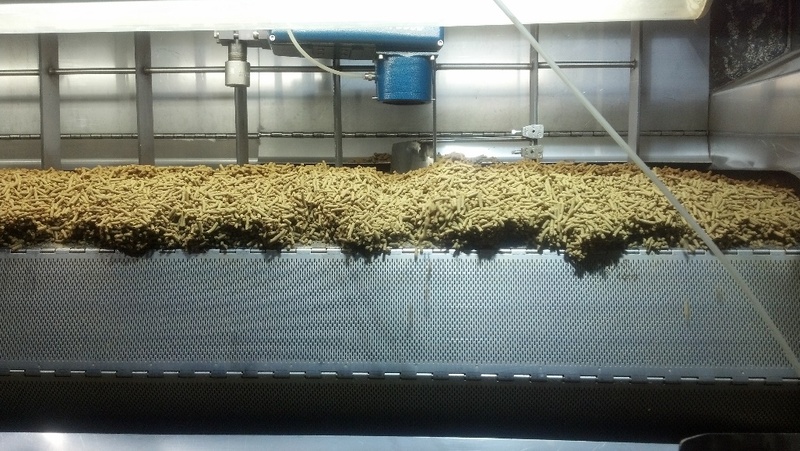 Monitoring the moisture in the raw materials, controlling the mixing/blending process and moisture of the feed not only ensures the final product with consistent quality, but will enable substantial savings to be achieved in the production process. The user will know the levels of moisture in the raw material and will be able to accurately calculate the amount of moisture that needs to be added to the mix to achieve the correct consistency of the end product. The MoistTech Online sensors can be installed into any hopper, silo, material line, belt or screw conveyor and the moisture results are displayed on a color touch screen or output on any of our many signal options. The installation of our On-line Sensors prevent bad product due to undesirable moisture levels. Now you can fine tune your setup to make sure you are putting out a higher quality and more consistent product and ultimately improve your bottom line. Save money, time and prevent negative results due to inconsistencies and human error. The IR3000 is MoistTech’s Online Sensor that was developed for instant, non-contact analysis in the harshest environments. Insensitive to material variations such as particle size, material height & color, the IR-3000 provides continuous, reliable readings without drift or frequent re-calibration. Using this device, operating personnel can make immediate process adjustments based on real-time measurements. The net result is improved quality and reduced production costs by savings in energy and loss reduction.